We all create waste, but most of us have the ability to dispose of it. Not so for the Zabbaleen, a community of people who populate Garbage City outside of Cairo in Egypt. For them, there is no escape from the ever-steady flow of trash. 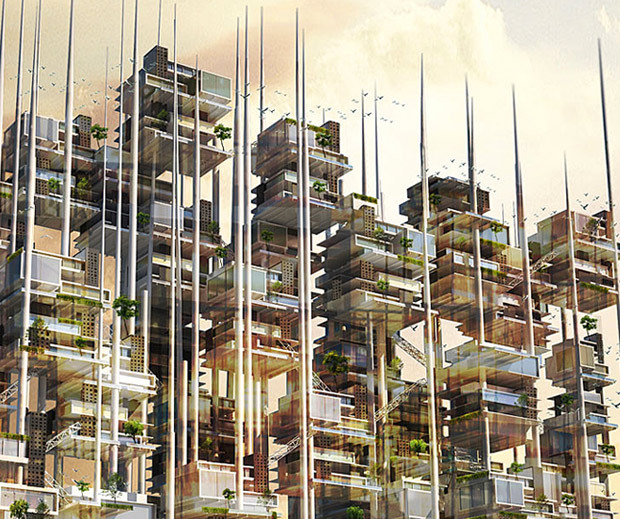 Wondering how this heap of waste could be viewed as an advantage instead of as a bane, Mekano Architects came up with their proposal to recycle it as building material for a large-scale vertical city that could mark a new era for Garbage City. 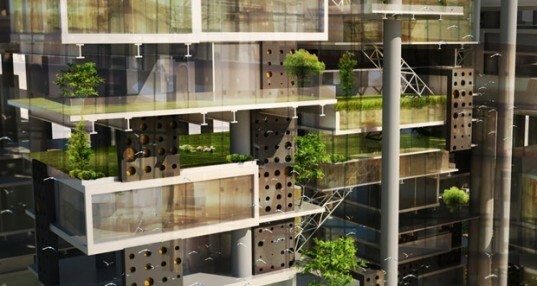 Called Seeds of Life, the skyscraper is based on a patch of soaring "wind stalks" that can be fitted and stacked with modular homes. As it stands, Cairo is one of the most polluted cities in the world. Seeds of Life proposes to bury much of the organic garbage in order to harvest biogas, while using other waste as building materials for prefab homes. The city of apartments would start as a collection of stilt-like poles where various types of modular living and working units could be plugged-in. In addition to private spaces, parks, sporting facilities and plazas will be available to the public. The design also calls for terraces where food could be grown and rainwater could be collected. In addition to the biogas, the city would be powered by the tubes that support it. These “wind stalks” would be tipped with mini turbines that collect wind energy, and would also work as a vertical circulation system as well as a way to circulate biogas, water and electricity from underground holes throughout the development. Nice effort. Who in Egypt is behind this? Some of the close-up renderings appear to be very modern and maybe luxurious... i think that this luxury doesn't fit with the place and the project. Solidarity, rather than luxury. As it stands, Cairo is one of the most polluted cities in the world. Seeds of Life proposes to bury much of the organic garbage in order to harvest biogas, while using other waste as building materials for prefab homes. The city of apartments would start as a collection of stilt-like poles where various types of modular living and working units could be plugged-in. In addition to private spaces, parks, sporting facilities and plazas will be available to the public. The design also calls for terraces where food could be grown and rainwater could be collected. In addition to the biogas, the city would be powered by the tubes that support it. These "wind stalks" would be tipped with mini turbines that collect wind energy, and would also work as a vertical circulation system as well as a way to circulate biogas, water and electricity from underground holes throughout the development. Holes in the facade would serve as homes to attract birds and other wildlife. The floorplan of Seeds of Life. Mekano came up with this story board illustrating their plan to distribute their proposal to the inhabitants of Garbage City in hopes that it will be an impetus for change.